Despite assurances from the North Carolina Department of Insurance that misleading language would be removed from a state insurance FAQ, the content remains more than a year later and is still being used by at least one insurer to dispute an auto body rate, a repairer said. Can an insurance company tell me where to get my car fixed? No. An insurance company cannot require you to go to a particular repair shop. An insurer can suggest a repair shop. If the company can have the same repairs completed at a lower cost from a different shop, you may be required to pay the difference. The insurance company is responsible for the cost to repair your vehicle. This does not necessarily mean the estimated amount by the repair facility of your choice. If the company can have the same repairs completed at a lower cost from another shop, you may be required to pay the difference. No insurance company can require the use of after market parts in the repair of your vehicle unless the part is equal to the original part in terms of fit, quality, performance, and warranty. Any modifications made necessary because of the use of after market parts shall be included in the estimates. You can choose not to have after market parts placed on your car, but you may be responsible for any additional cost. Bradshaw asked the agency if the offending content — which gives the impression that an insurer could simply find the cheapest shop in the state and make a customer with a different preference pay the difference — was part of state law. “All they have to pay is the lesser amount,” Bradshaw said, and noted that this could be misinterpreted for other non-part aspects of the repair as well. Mitchell: Labor rates fail to keep up with inflation in some states — including R.I.
Bradshaw, who is now on the Society of Collision Repair Specialists board, said the agency told him “We weren’t able to find anything,” but “it’s just industry practice” for insurers. Not satisfied with that answer, he and other shops and obtained a January 2014 meeting with Insurance Commissioner Wayne Goodwin, a North Carolina legislative counsel (who has since moved on to another job) and a deputy commissioner. The state came back and said, “We’ve looked, we’ve researched … you’re right,” Bradshaw said. It wasn’t state law. Those curious about how to successfully recoup costs should check out “Getting Paid for Investing in Facility, Equipment and Training” by Tim Ronak, AkzoNobel Automotive and Aerospace Coatings, at the SEMA Show as part of the Society of Collision Repair Specialists’ Repairer Driven Education series. Register here. 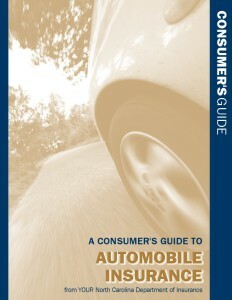 In fact, another question on the guide’s Page 21 states that if customers dispute the amount the insurer will pay for the claim, they can exercise an appraisal clause in their policy and have a state umpire weigh the difference between an insurer and customer’s appraisals. The Insurance Department promised to change the copy next printing, Bradshaw said. A few months later, still early in 2014, he asked the counsel when it would be changed, but failed to gain any traction. It’s August 2015, and the content remains online. State budgets are tight, so one can understand if not necessarily condone the hesitation to print more copies. But changing a PDF online, as Bradshaw suggests? That’s easy and cheap. The insurance department did not respond to a phone and email request for comment. GEICO did not return a phone or email request for comment. Neither did Auto Owners Insurance, which Bradshaw said has used that language to dispute rates in North Carolina. 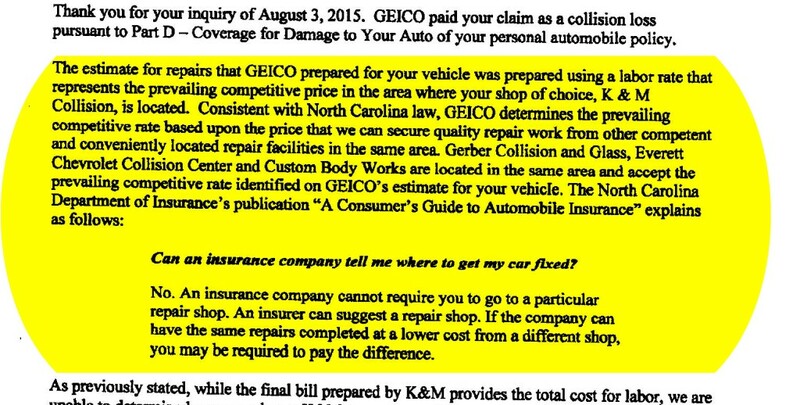 The GEICO letter also says that without an itemized breakdown of the repair bill, the insurer can’t calculate the cost of the repair. But Bradshaw pointed out that his estimating software produces the bill in dollar amounts, not time units, but he noted that the rates for each hourly figure are included in the invoice. So GEICO — which remember, is a subsidiary of financial whizzes Warren Buffet and Charlie Munger and also employs pro mathematicians as actuaries — is saying it can’t do junior high algebra (There’s only one variable, so technically, it’s elementary school long division.) or be bothered to turn on Excel. “They just don’t care to,” Bradshaw said.